2 Pendulum Monsters If this card is Link Summoned: You can add 1 Pendulum Monster from your Deck to your Extra Deck face-up. Once per turn: You can target 1 other face-up card you control; destroy it, then add 1 face-up Pendulum Monster from your Extra Deck to your hand. If a card(s) in your Pendulum Zone leaves the field: Draw 1 card. You can only use this effect of “Heavymetalfoes Electrumite” once per turn. The Pendulum Monster that cemented the Pendulum archetype, this monster may not have boss monster statistics, but it’s ease of summoning, combined with its effects make it one. Two Pendulum Monsters is ridiculously easy to summon if you run a few Pendulum Monsters. A 1-for-1 initially off its first effect, you are likely going to pop a scale to activate that scales effect, netting you a plus. Simultaneously, if a card(s) leave your Pendulum Zone you get to draw a card. Summon this, pop your scale, get something from popping it, destroy a card your opponent has, draw a card off the 2nd effect, then complete your scales and Pendulum Summon. Electrumite made decks like Pendulum Magicians the top deck during the year at one point, as well as lent support to decks like Igknight and Lunalight. This one card dramatically solidified the Pendulum Magician deck and made it number one. Even with links now the number #1 way of Extra Deck summoning, Electrumite was, and still is the Pendulum Summon stronghold. Now it is time for the real Top 10 cards starting off with something from the beginning of the year all the way in Extreme Force, Heavymetalfoes Electrumite. Electrumite is a Link-2 FIRE Psychic with 1800 ATK and arrows pointing Bottom Left and Bottom Right. ATK is acceptable for a Link-2, the arrows are outstanding for a Link-2, Psychic is solid, but I still want FIRE to be better than it is. The summoning requirements are 2 Pendulum Monsters, which is easy enough. If this card is Link Summoned, you can add 1 Pendulum Monster from your deck to your Extra Deck face-up. This helped bring your Astrograph Sorcerer into circulation before that card was banned, but it does help you bring resources to your disposal with greater ease. Once per turn, you can target 1 face-up card you control and destroy it to add a Pendulum Monster from face-up in your Extra Deck back to your hand. This also helped Astrograph Sorcerer as once you have it in your hand, you can summon it and search for whatever Electrumite destroyed while at the same time triggering an effect from the card Electrumite destroyed. Finally when a card in the Pendulum Zone leaves the field, draw 1 card. This isn’t optional, but a hard once per turn, and I don’t think anyone is complaining about drawing cards. Electrumite allowed for some strong plusses with or without Astrograph and now sees himself under the Limited section. Electrumite is still a 1 of in Pendulum Decks because it is a very strong 1 of. Art: 4/5 I really like the Metalfoes in terms of artwork. Heavymeatalfoes Electrumite…Link 2, Psychic, reasonable 1800 attack, Fire type, specifically requiring two Pendulum Monsters with arrows to the bottom diagonals. This is one speedy Monster. When Link Summoned, you gain a Pendulum Monster from your Deck to the Extra Deck (face-up) and while that doesn’t sound like much on its own, the card does more in cycling as well. Once a turn, you can target and destroy another face-up card you control, then a face-up Pendulum Monster from your Extra Deck to your Hand. All of a sudden, that comes together for you rather nice, rather quickly, doesn’t it? You’re also granted a Draw if a card(s) in your Pendulum Zone leaves the Field. All these effects are simple and easy, which made Electrumite an asset to many Decks, namely Magician/Pendulums. Heavymetalfoes Electrumite has a long name and fits in with all Pendulum Decks. It’s a Link 2 Fire Psychic-type Link Monster with 1800 Atk and Bottom Left and Bottom Right Arrows. You need any two Pendulum Monsters to Link Summon this staple card. It’s a staple because it rewards you for using it. 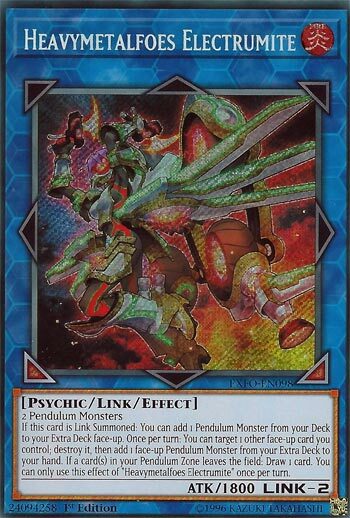 You can add any Pendulum Monster from the deck to your Extra Deck face-up after Link Summoning. That effect is not once per turn, so go ahead and spam Heavymetalfoes Electrumite (if it weren’t limited). Then you can destroy any other targeted face up card you control to add a face-up Extra Deck Pendulum Monster to your hand. That effect is once per turn, but destroying your own scales should make you gain even more advantage. Finally, you get to draw once per turn every time a card from your Pendulum Zone leaves the field. I like that Heavymetalfoes Electrumite can trigger all of its own effects in the same turn whether you go first or not. Then an 1800 Atk body is not so bad and can still grant you more plusses. Definitely worthy of the limit and the number 10 spot.